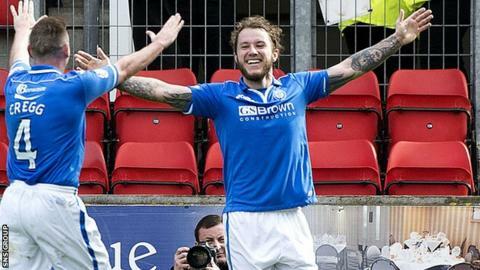 St Johnstone striker Stevie May plans to open contract talks with the Perth club before the end of the season. The 21-year-old signed a one-year extension in October, tying him to the Perth club until the summer of 2015. "We're hoping to sit down in the next week or so, have a discussion and see what both parties have got to say," said May. "I don't see any reason why I shouldn't be here next season. I love it here and I've had a successful season." May, a PFA Scotland young player of the year nominee, has scored 26 goals during this campaign, following prolific spells on loan at Alloa and Hamilton. And it was a double from May that shot Saints into their first Scottish Cup final - against Dundee United next month. "It's a club that's close to my heart," added May, who made a scoring Saints debut as a 16-year-old substitute. "I live just round the corner from the stadium, which is perfect for me and my family. "There is no reason for me to say I want away. I'm in no rush to move to England. I'm still improving and this is the perfect club for me to develop at." The in-form forward made his Scotland Under-21 debut this season and manager Gordon Strachan is mulling over including him for the senior squad for a 28 May friendly with Nigeria in London. However, the U21s play an important European qualifier against the Netherlands on the same day. "I heard what Gordon said and if I got a call-up it would be the perfect end to a perfect season," enthused May. "I believe I'm ready for international football. It is a big step up but if I was fortunate enough to get that chance I'd be honoured to represent my country. "We've got the Scottish Cup Final coming up so it could be a fantastic couple of weeks if it does come true. "It's hard to believe I was playing in the Third Division with Alloa only a couple of seasons ago and now I might get a chance with Scotland. Andy Robertson has done that already after moving from Queen's Park to Dundee United but it only took him one season."